2010 April — Open Source Strategies, Inc.
We’ve just launched our first e-commerce site with Magento, and it’s the new opentaps online video store. 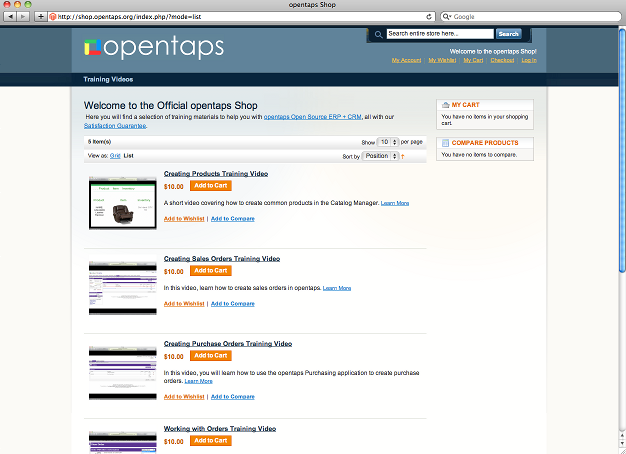 On this site we will be offering downloadable training materials for opentaps Open Source ERP + CRM. Some of these, like the training video for setting up products in the OFBiz catalog manager, would also apply to OFBiz as well. We envision this site eventually to be a place where all the opentaps service providers and developers could sell their training materials such as videos or e-books about opentaps or their add-on modules. Compared to other open source shopping carts or e-commerce systems, Magento is much more polished and out of the box ready to use. We made very small changes to the out-of-the-box CSS styles, but the catalog display pages and most importantly the customer checkout sequence worked for us without any made modifications. The way that Magento handles downloadable products like online videos is also well thought out. It allows you to have a sample download, so your customer can preview before buying. You can set the number of times a customer can view the download. Last of all, it scrambles the download URL link for you, so somebody can’t just e-mail a download link to their friends and have them get it for free. The configuration was fairly consistent. Most of the setup could be done in the administrative user interface, though a couple things like call out messages were hard coded and required modifying files. The administrative user interface is very professionally done and consistent. Nevertheless, setting up an online store is still work. There were quite a few screens you had to go around to set up your store, categories, products with prices, links, etc. It almost makes me wonder “aren’t there other online video stores out there?” Shouldn’t there be a standard template already?